Monotny, C. P. R. R. -- A station and two small wooden buildings; a blank waste of prairie, a line of track straight to the level horizon, a cloudless sky. The Ogden express (eastbound) is waiting upon a siding. A distant whistle, a faint hum, a vibrant roar -- a pounding, rattling rush of noises and the West bound Chicago limited throws itself alongside the station, panting and throbbing. The airbrakes settle back with a long hiss, the excape valve roars hoarsely, a cloud of vapor rising like the genie emerging from the bottle while the locomotive drinks eagerly from the tank. Dusty travelers crawl from the coaches and pace stiffly up and down the board walk in the sunshine. A young man with a golf cap and a cigarette walks leisurely down the alley between the trains and seats himself upon the steps of a vestibule of the Ogden express. Directly opposite him is the platform of thelast Pullman of the Chicago limited. Through the door of this coach enters to him a young woman -- a lady, by every proof of face, dress and bearing. 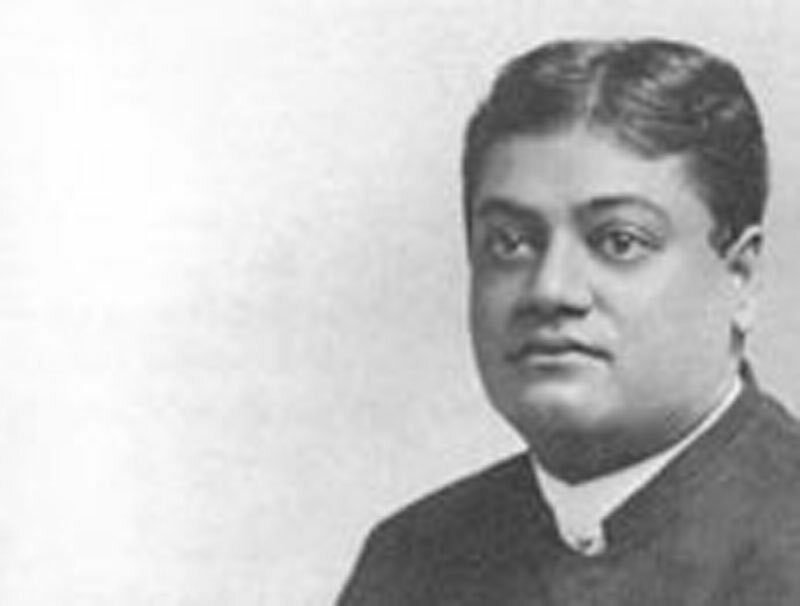 She holds in one hand a notebook of the lectures of Vivekananda, and stands by the iron rail of the platform after glancing frankly at the young man. After a minute she speaks -- always in a low, dreamy, almost impersonal tone and manner. He is keenly sensitive, yet obviously restrained, as if uncertain of the niceties of his replies. She: "Are you what is called conventional?" He: "I beg your pardon; are you speaking to me?" She: "To you -- yes, in a way. To the individual You, not the personal You, though. Do you know what I mean?" He: "Why, yes, I think so; yet if I do know what you mean, there is no need of asking such a question, is there?" She: "That's very true. Still, it was such an effort to speak at all. You might so easily have misunderstood me." He: "You can trust me -- we are of the same caste, I assure you -- and there are some things that even a man knows by intuition." She: "You think so? Then you think we can say what we really think, without disguise, in these three minutes? The porter said we were to stay here only three minutes." He: "But why for only three minutes?" She: "Ah, that's the mystery of it all! Why is it? Yet if it were for the longer, I would never dare speak to you at all. But it has seemed so strange to me -- these flying glimpses of people -- little images seen in a flashlight picture, and then fading away into nothing. I couldn't stand it. It seemed as if I must speak to some one, and say something real, and then be swept apart. What does it all mean? Do you think we have ever met before?" He: "Why, yes -- I know it." She: "You feel it too? Oh, I wonder when! Perhaps thousands of years ago -- who knows?" He: "I fell sure of it." She: "Do you," I wonder how we shall know each other! If I could give you some word to know me by! Some message for you to keep! I fell as if you were on some passing star, and I trying to speak to you, before you were swept into space again. It's all like a dream! I wonder if you understand why I am talking to you like this." He: "I think I understand you better than you understand me." She: "Why? But there is the bell, and I shall never know -- till the next time. Goodby! See your train is moving, you must hurry! Goodby! Oh, oh, get on your train. Please! Oh, you will be left! Why don't you go? You must go! -- There, the train has gone! What do you mean? You mustn't follow me, you will spoil everything. Oh, why did I begin this! What are you going to do?" He: "I am going to Ogden, I hope you will forgive me!" She: "But you were on the other trian!" He: "For three minutes only. I have been in this one, four cars behind you, ever since we left Chicago."